From the January-February 2013 issue of Fleet Management. Before taking a closer look at the Lexus GS range of sedans, it’s important to note where this product sits in the extensive roster of luxury vehicles marketed by Toyota’s upscale division. There are three other sedans in the Lexus lineup dubbed IS, ES and LS. Each has its role in life but the GS is something of a maverick, first launched in 1993 as a sports sedan to fit the slot between ES and LS models. It’s always offered a combination of high style and solid performance. In some respects, it rivals the BMW M5 and Mercedes-Benz E-Class AMG—both largish sedans with sporty pretensions. To cement the fact that the GS was a valid competitor in this European-dominated segment, Lexus had the original car designed by Italdesign Giugiaro SpA studios in Italy. 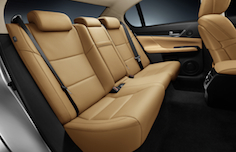 Lexus launched a fourth-generation GS last year as a 2013 model, ‘all new’ inside and out. It’s interesting to note that the range wasn’t sold in its home country of Japan until the third generation, though it’s always been manufactured there. Although not the most popular of Lexus sedans in Canada, it could be the most intriguing, and in the eyes of many, the best looking. It certainly deserves more attention from the near-fullsize executive market. One of the best aspects of the GS range is the variety of models available—and we’re not simply talking trim choices here. The car can be ordered in “basic” GS 350 RWD form with rear wheel drive and a 306-horsepower 3.5-litre V-6. Also offered is an all-wheel drive version of the same model (GS 350 AWD) plus a 338-horsepower GS 450h hybrid. While there are other luxury car ranges offering similar choices, they are far from common. The hybrid might be especially appealing for executive fleet use by companies operating in the environmental and associated fields, or firms wanting to make a “green statement” with their executive cars. The most recent Lexus we drove from this range was a GS 350 AWD, so we’ll focus on that for this report. The GS 350 has always had rather rakish styling, almost as though that initial Italian design influence was carried over from generation to generation. Lexus points out that the GS picks up styling cues from the limited-production LFA supercar and there are certainly some comparable design elements here and there. The new car has a massive grille, which seems to have become something of a trademark for Lexus recently. It’s distinctive, as are the flared headlights which have a “necklace” of LEDs below them—a styling quirk that seems to have become de rigueur for luxury cars in recent times. The doors are wide for both front and rear occupants, a useful feature for business use where the rear seats will probably do their share of work. The rear of the car is nicely sculpted and the trunk is surprisingly large. Cast alloy spoked wheels compliment the GS nicely, but look as though they may be something of a challenge to keep clean. At the heart of this car is the silky-smooth V-6 which has benefited from a good deal of work to reduce what automotive engineers call “noise, vibration and harshness”, or NVH. The result is a very refined automobile that is remarkably quiet, even when accelerating to high speeds. The engine compartment is exceptionally well insulated from the interior and it could be said that few automakers do this better than Lexus. Most of the prestige automakers in Europe and North America regularly “benchmark” Lexus products, though few would admit to this. Lexus refinement is something of a world standard around the industry. The engine is well matched to a six-speed electronically controlled automatic transmission that has a sequential shift mode with paddle shifters for rapid manual changes. Frankly, modern automatic transmissions shift so quickly and reliably that those paddle shifters are more of a selling feature than a necessary asset. Factor in the torque and flexibility of this car’s engine and you have a sedan that would only need manual override on an Alpine pass full of hairpin bends. The GS 350’s powertrain provides a level of fuel economy that’s acceptable, but not earth-shattering. The AWD version is a good choice for companies operating in snowbelt areas because it’s very stable and confidence-inspiring when the going gets slippery. Lexus has considerable experience engineering AWD systems for its SUV range. 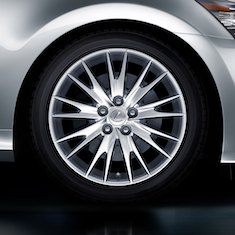 The system in the GS 350 AWD transfers traction to the wheels with grip when any traction is lost. Under normal conditions, 70 percent of power goes to the rear wheels and 30 percent to the front. As with any luxury car these days, considerable time has been spent on the development of safety systems, many of which have been pioneered by Lexus. The simple fact is that buyers in this class expect a full roster of safety technology and any automaker that ignored these demands wouldn’t be in business very long. At the heart of any truly safe automobile is good impact-absorbing bodywork and to this end, Lexus worked long and hard, aided by computer programs, which can create crash scenarios even before the first prototype car is built. Of course, models at the GS’s price level have a full suite of electronic safety features too and these include the usual traction control, antilock brakes, electronic brakeforce distribution and brake assist. What this all means is the car will “do its best” to avoid an accident even if the driver has basically lost control. To round off the package, there are no less than 10 air bags. As with any Lexus, the interior is a delight, with a superb level of trim fit and finish, first-class materials and an impressive array of controls and instruments. Perhaps there are even too many switches and knobs. Automotive engineers are said to be looking at control simplification for future vehicles. Certainly, it wouldn’t be a bad idea to hide little-used controls under a cover of some kind. However, the GS is very well laid out and owners should soon get used to where everything is. Lexus is now using a mouse-like control on the centre console to the right of the shift lever, which functions well for the navigation system and other features. It’s easy to use without looking at it with a little practice; after that, all the driver has to do is glance at the big central screen. Happily the car boasts a “proper” clock in the middle of the dash and not a digital readout hidden among other displays. The leather seating is comfortable, front and back, and the detailing is outstanding. There’s no question the rear seats are more than adequate for adult use, an important fleet consideration for airport pickups and the like. There is room for three in the back, but the central passenger won’t be too happy and anyway, there’s a handy fold-down console/armrest that adds to the comfort of just two rear occupants. Enhancing the ambiance of the GS are warm white LED interior lights and included are footwell lamps, reading lamps and even one or two more handily placed lights. The car carries on the “sports sedan” tradition of the GS range and is a lot of fun to drive for a fairly large car. It handles very well and there’s lots of power from the V-6. For several generations, there was a version of the GS with a V-8 under its hood, but no more. The simple fact is that automakers are now getting V-8 power and flexibility out of simpler V-6 engines and there are obvious benefits with regard to economy. There are plenty of choices in the market for luxury cars of this size, but only the very best of them match or exceed this Lexus. Given Lexus’s reputation for durability, quality and resale value, this car is also very keenly priced for the kind of equipment and performance it offers.